English classes were conducted for the youth of Bendum from 22 April to 19 May this summer. This was an activity under the Hulas Training Program of the Environmental Science for Social Change (ESSC). 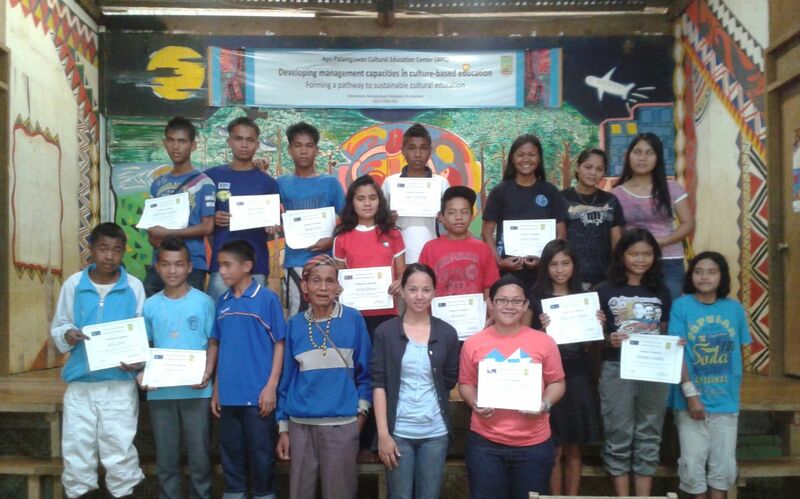 APC assisted by developing the lesson plans and Mitchiko Aljas, Hulas Youth Coordinator, managed the program and taught the first two weeks of classes. Two graduates from Xavier University (XU), the Jesuit university in Cagayan de Oro, volunteered to teach the last two weeks of classes. One is an Education graduate, Melanie Tagaylo, and another is a former Year of Service (YOS) volunteer, Alexis Yonson. YOS is an XU-based volunteer-sending program aimed at helping facilitate development in Mindanao. The students were divided into two groups—a Basic English Class (pictured above) and an Intermediate English Class (pictured on the right). Basic English class had 16 students and was held in the mornings, while the Intermediate English class had 13 students and was held in the afternoons. 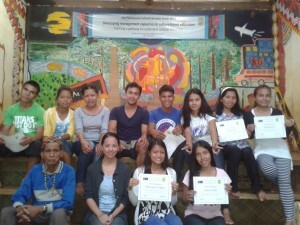 Participants included APC graduates and high school scholars. Some of them are still in high school, a few are in college, and a couple are working in the ESSC programs in Bendum. Participants of the program said the English lessons expanded their vocabulary and allowed them to review grammar rules. Most importantly, they gained confidence in speaking English and developed a greater ability to converse in the language. They could often be heard practicing their sentences outside of class, even while at work in the farm.